Comments: This movie is more of a romance film than a disaster film. 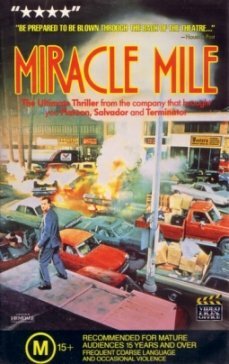 Still, 'Miracle Mile' has an interesting aura of impending doom that never lets up and keeps you watching to the bitter end. A must see, especially for apocalypse film lovers. Special Effects: The effects shots were brief and implied more than they showed. This is an asset to a film that relies more on good story telling than on "show pony" effects.